*Volkswagen Credit available to leases maturing between October 1 and December 31, 2019. Volkswagen Credit will cover up to 3 remaining payments for customers financing or leasing any new Volkswagen through VCI. See dealer for complete details. Offer expires 04/30/19. 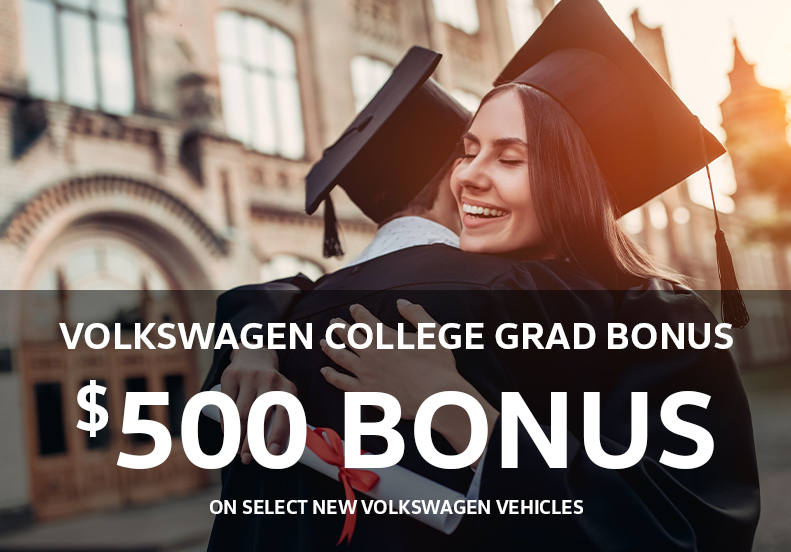 The Volkswagen College Graduate Program® offers a $500 Contract Bonus (for qualified college graduates who lease or purchase a new, unused Volkswagen vehicle through Volkswagen Credit. College Graduate Program is subject to credit approval and is available to U.S. citizens or permanent residents who graduate from a U.S. or Canadian accredited college/university no more than 24 months prior to credit application. Applicant must be employed in a full-time permanent position or have a written commitment from a future employer. References, proof of income, copy of degree or official transcript, and contact information for college/university required. Credit history is not required, but existing credit must be in good standing and have no previous derogatory credit. Program good from January 3, 2019 to January 2, 2020. Volkswagen of America, Inc. will pay a $500 Contract Bonus when customers eligible for the College Graduate Program lease or purchase a new, unused Volkswagen vehicle through participating dealers and finance the lease or purchase through Volkswagen Credit from January 3, 2019 to January 2, 2020. Excludes Certified Pre-Owned vehicles. May not be combined with VW TDI programs (79L and 81R). Subject to credit approval by Volkswagen Credit. Bonus must be applied toward customer lease or purchase and is not redeemable for cash. For those who serve...And love to drive. 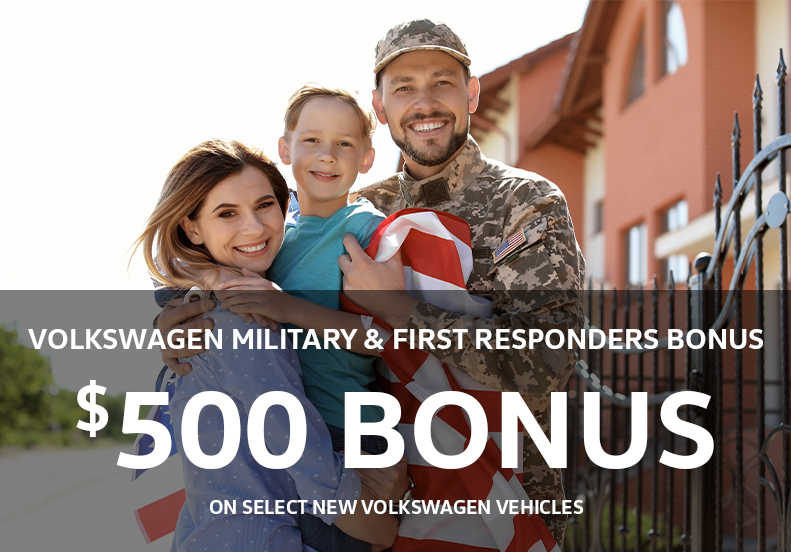 Volkswagen of America, Inc., will pay a $500 Military and First Responders Bonus for qualified active duty U.S. Military service members, U.S. Military Veterans (Veterans must be within 24 months of active duty), U.S. Military retirees, First Responders (Police Officer, Sheriff/Sherriff's Deputy, Correctional Officer, State Trooper, Federal Law Enforcement Officer, Firefighter (career or volunteer), EMT, Paramedic, 911 Dispatcher/Operator) and their family household members who purchase or lease a new, unused MY14-MY19 Volkswagen model (excluding Golf R) through participating dealers from January 9, 2019 to January 2, 2020. Proof of military/first responder eligibility and residency of family household member (if applicable) required. Bonus applied toward MSRP and is not available for cash. Fleet customers are not eligible. One bonus per VIN. Eligible customers may receive this bonus on up to two Volkswagen vehicles per year. 2019 Volkswagen Jetta S | VIN # KM082839. MSRP: $20,675. $0 due at signing. Payment includes bank fee, dealer fee, electronic filing fee. Payment does not include sales tax and tag. For highly qualified customers through Volkswagen Credit. See dealer for complete details. Offer expires 04/30/19. 2019 Passat GP SE R-Line 2.0T Automatic| VIN # KC004132. Starting at $349 per month, 48 months, 7,500 miles per year MSRP: 31,500. $0 due at signing. Payment includes bank fee, dealer fee, electronic filing fee. Payment does not include sales tax and tag. For highly qualified customers through Volkswagen Credit. See dealer for complete details. Offer expires 04/30/19. 2019 Volkswagen Atlas SE. 2 or more vehicles available at this price. Based on MSRP $37,040. Lease for 36 Months. Includes 7,500 mi./yr. Valid only when leased through Volkswagen Credit LLC to well- qualified lessees. May not be combined with other offers. $0 security deposit. Plus $4,175 down payment, $625 bank fee, $899 dealer fee, tax, tag, title and state fees with approved credit through Volkswagen Credit. Not responsible for typographical errors. Expires 3/31/19. 2018 Volkswagen Tiguan SEL. VIN# JM155381. MSRP: $34,305. Plus $899 dealer fee, tax, tag, title and state fees with approved credit through Volkswagen Credit. Not responsible for typographical errors. Expires 04/30/19. 2018 Volkswagen Tiguan SEL Premium . VIN# JM126116. MSRP: $37,470. Plus $899 dealer fee, tax, tag, title and state fees with approved credit through Volkswagen Credit. Not responsible for typographical errors. Expires 04/30/19. 2018 Volkswagen Jetta GLI. VIN# JM243460. MSRP: $30,815. Plus $899 dealer fee, tax, tag, title and state fees with approved credit through Volkswagen Credit. Not responsible for typographical errors. Expires 04/30/19.